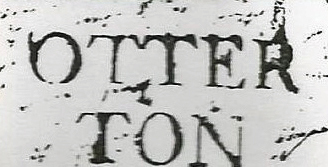 The first letter seen known to have passed through Otterton Post Office is dated 1785. This is an entire bearing an OTTER/TON, in two lines mark. The Office was probably in the New Inn, licensee, Thomas Woolcott. In 1795 Matthew Goodyear Palmer was granted the lease, which he had renamed The Kings Arms by 1800. It is assumed that the inn was also the Post Office, although it is not until 1850 that it is first named in Whites Directory as Post Office viz: “Robert Ven Palmer (Matthews son); Post master and licensee; letters dispatched 4.30pm”. A plan of the old Kings Arms of 1870 shows a shop at the rear, which would also have been the Post Office. 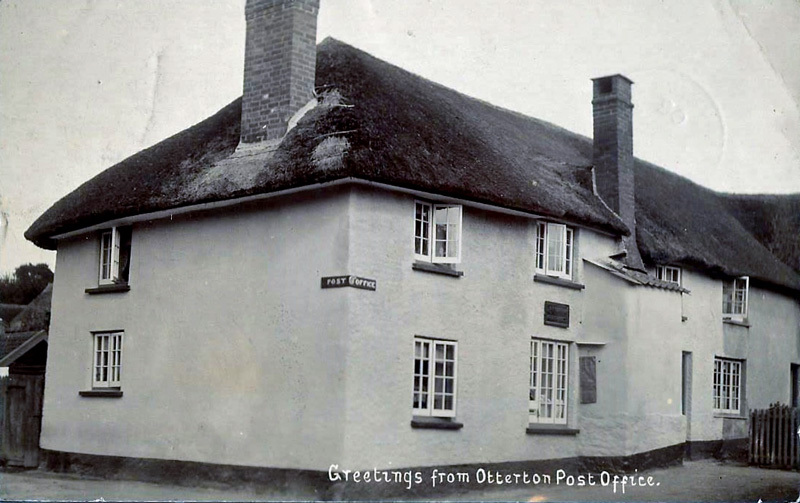 Until the Uniform Penny Post was introduced in January 1840, Otterton was the Penny Post Town in the Lower Otter Valley with Receiving Houses (ie sub Post Offices) at Budleigh Salterton (No.1) and East Budleigh (No.2) Colaton Raleigh did not have an office. Post sent within these places cost 1d. and various rates applied outside their area eg.4d to Exeter; 11d to London. Otterton Penny Post mark 1837 with “No.1”mark of Budleigh Salterton. After 1840 Otterton lost its “Town” status and became a sub office, first to Sidmouth in 1843 and then Budleigh Salterton in 1851. 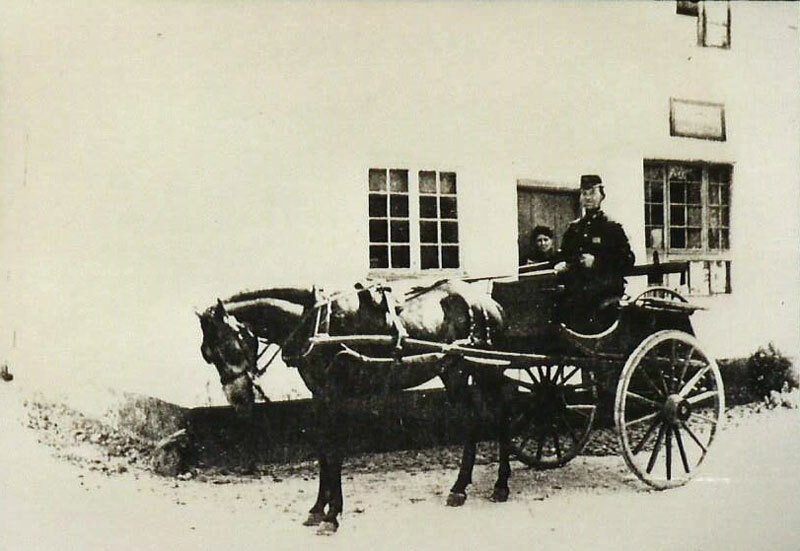 John Palmer (Roberts son) left the Kings Arms in 1856 and his successor, Edwin Snow relinquished the Post Office, which was taken by Thomas Tedbury, the saddler and harness-maker in Brook House, Fore Street. Letters arrived 9.30am and dispatched 4.40pm. By 1866 the Office had moved again to No 1 The Green – Robert William Hayman, Baker, Registrar for Births & Deaths. Mail arrived 9am and dispatched 4.45pm. 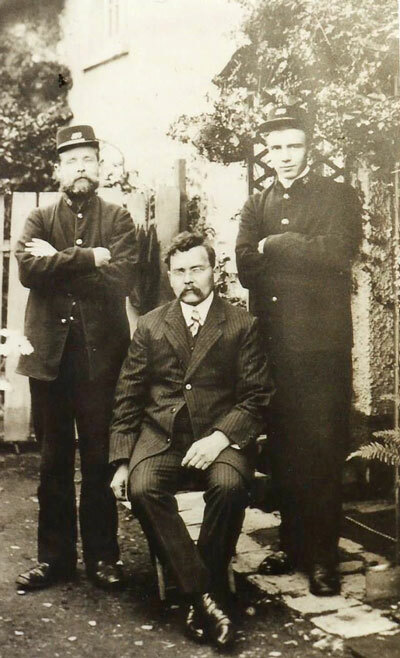 1880 William Freeman was appointed village sub-postmaster. 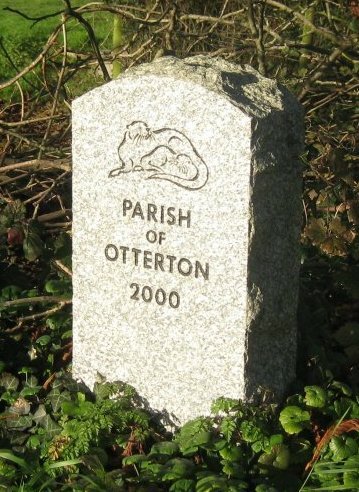 He had been living in Otterton since 1871 a shoemaker from Sidmouth and was a tenant of Mary Ann Pile Rental No.32. When her lease expired he took over the tenancy in 1898. He died seven years later aged 58. Williams son George Bastin Freeman continued as Postmaster and having taken Harry Pasham Genge into partnership they built the extension on the east end which became the new shop and post office, taking a new lease in 1923. Harry Genge had been Lord Clinton’s valet. The lease was renewed in the 1940’s. George Freeman died in 1948 and his nephew Wilfred Manns became Sub-postmaster. 1951 a new lease was granted. After Wilf. Manns death in 1962 postmasters changed a number of times. In 1972 the Estate sold the Freehold to Stanley Watson. He had held the business since April 1964. By 1985 Philip Tisdale was sub-postmaster, followed by Martin Edwards in 1988 and Mark Iliffe in 1992. In 1996 Mark Iliffe converted the outhouses into shop and post office and the old shop was absorbed into the house. September 1998 Mark Iliffe decided to close the store and gave notice to close the Post Office Counter. 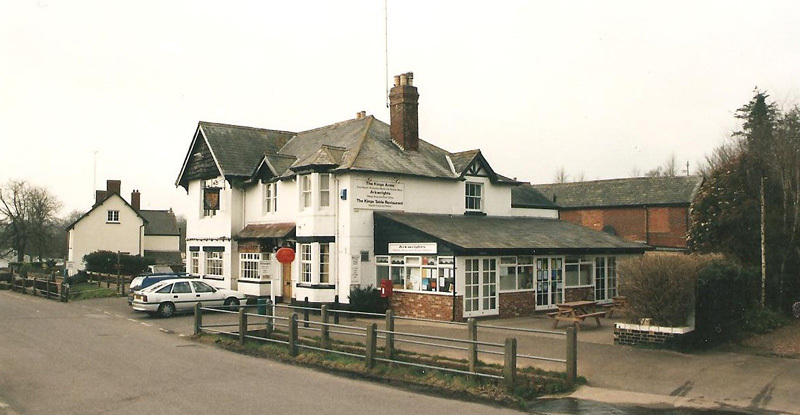 A Public Meeting was held to express concern at the loss of the Village Shop and shortly after the Post Office Counter was transferred to the Kings Arms. 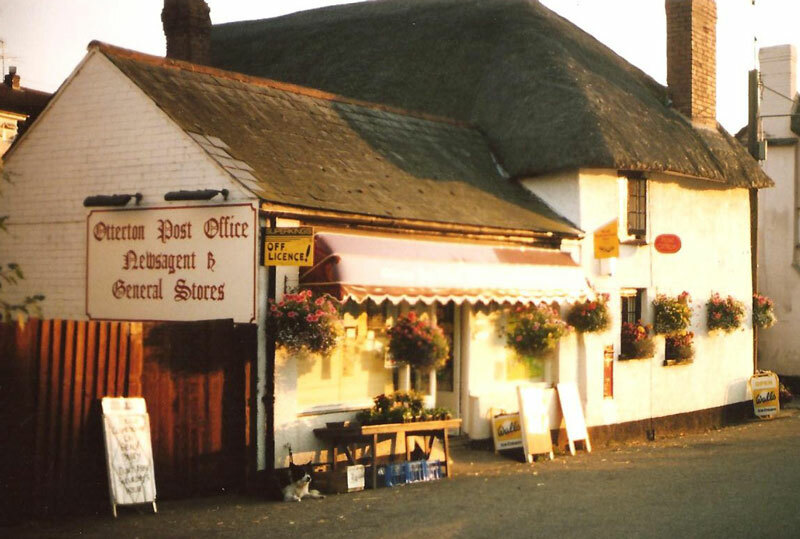 The restaurant in the conservatory adjoining the inn was converted to a new village store and post office in October 1998. In the meantime late September 1998 Mark Iliffe was sued by the Post Office Counters to cover £1.1 million and the following December was tried at Exeter Crown Court and sentenced to 5 years in prison for fraud. On 28th. July 2006 the shop and post office were closed by the owner of the Kings Arms. Mr. Harry Blundred. The village was then without a shop/store for eight years and also lost its Post Office license. 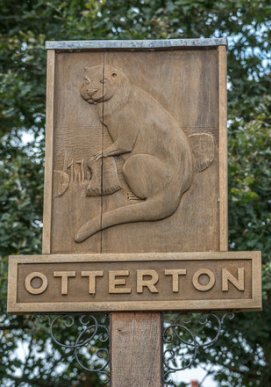 Photos from Otterton School collection and G.M.